We offer a range of crowns to suit your specific needs. Dental crowns require some removal of the tooth structure and are suitable for most teeth. If your tooth has been severely weakened with large decay or damaged due to trauma then covering the entire surface of the affected tooth down to the gum line may be the best permanent solution. Crowns, like veneers, are designed to mimic your natural existing teeth and appear unnoticeable. Again, many patients are advised to consider teeth whitening options to complement this cosmetic dental service. Crowns (aka caps) can be created from a variety of materials including metal, porcelain fused to metal, zirconia, or completely ceramic. Whilst your crown is being fabricated the dentist will insert a temporary crown made from acrylic until your permanent crown is ready. The temporary crown is easily removed for treatment of the root canal and to test fitting of the new crown. All crowns of this type provide the best natural colour match than any other crown type and may be more suitable for people with metal allergies. Mainly inserted over front teeth they are fractionally weaker than fused metal crowns, and they may wear down opposing teeth a little more than metal or resin crowns. This type of crown contains no metal and as such you will never have a black line near the gum line and many people choose this option for this reason. Porcelain and ceramic fused-to-metal crowns are colour-matched to your adjacent teeth after teeth whitening procedures are completed. The crown’s base is usually nickel or chromium but also may include gold and/or alloy. Next to all ceramic crowns, fused metal crowns look most like natural teeth; however, sometimes the metal underlying the crown’s porcelain can show. This dark line is seen at the gum line over time and from periodontal disease as your gums recede. These crowns are a good option for front or back teeth and more wearing to the opposing teeth occurs with this type of crown compared with metal. Metal crowns made from gold or a combination of palladium, nickel and/or chromium or gold withstand biting and chewing forces well and probably last the longest in terms of wear down. Often recommend for back teeth because they can’t be seen, wear on opposing teeth is minimal. 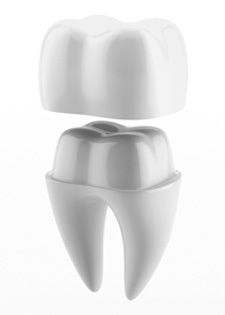 Less tooth structure is required to removed with metal crowns and provide maximum strength for molars. Also known as inlays and onlays, these more aesthetically pleasing fillings are considerably stronger and superior to either amalgam or composite fillings. Produced by the laboratory and ready within two weeks, they are recommended for the extra strength they provide to chew on in deep or large-tooth cavities. Your friendly dentist will help you decide whether replacing a metal (mercury) filling with an inlay is appropriate based on the age and condition of the filling. Other options include replacing with composite material (white filling).